GreenEarth is now a Wi-Fi zone! May this photogallery take you with us in our journey of how we conquered internet connectivity challenges at GreenEarth! We started our journey here at the foothills of the Sierra Madre Mountains, almost three years ago this month, with no electricity, running water, toilets and many other basic amenities that bring dignity to human existence. As we come close to celebrating our third year anniversary as a foundation on May 22nd, our pleas for a bridge over our river are still unheard. For the community we serve, it has been decades. We remain geographically isolated from the nearest township. Our roads continue to be rough and unpaved. However, our vision remains unstifled. The dream to connect our community to the rest of the world lives on! We desire to see every man, woman and child who hinges his or her hope upon GreenEarth to see a world full of possibilities outside. It all began over 2 years ago when geodetic engineers from the University of the Philippines camped out at GreenEarth for weeks to help with the geodetic mapping of our land . Their scientific curiosity led to the discovery of areas on our land where cellular broadband signal was strongest. Since that day in 2010, we purchased a portable broadband stick at GreenEarth, finally connecting our community to the rest of the world. We thank ACER Philippines for believing in our mission. They said they liked us because we were promoting environment and education at the same time. 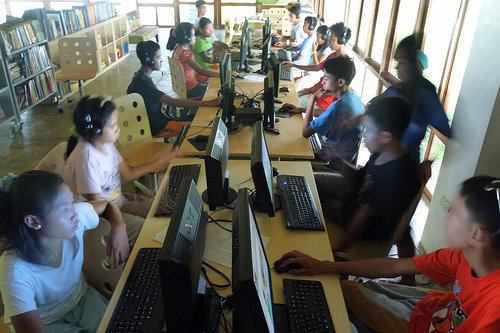 They gave us our first 9 computers as inaugural gift, allowing us to open our Library and Learning Center with a bang! We had limited internet connectivity on one computer initially and so everyone took turns to use it. The rest of our computers were just as busy –teaching the basics of computer use and Microsoft Office programs to our community members who were coming— mostly kids on summer break. Just this month, ACER gifted us with 8 more computers, thereby pushing our total number of PCs on-site to 17! We continue to invest in software programs related to phonics, reading, and other subjects to help our kids with their academic deficiencies. We have downloaded hundreds of conversational English youtubes on our PCs to make it easier for the kids to do independent learning, without much reliance on internet connectivity every second. Through the help of Joe Gene Quesada of Asia Pacific College, we were able to bring over 3,000 free online tutorials from one of Silicon Valley’s best and brightest people, Salman Khan, who was named by Time Magazine in 2012 as “one of the most influential people in the world”. As a result, the indigent Children of GreenEarth now have unlimited access to a wide range of Khan Academy’s superb academic tutorials on a server platform. Our entire IT set-up at GreenEarth from Day One was made possible by the hard work and ingeniousness of our Innovator-in-chief, Jan Vincent Realisan (JV), without whom the GreenEarth community will never enjoy leading-edge technology “in the middle of nowhere”. Thanks to JV, we now have Wi-Fi in our entire Learning Center, celebration hut, and farm office, which are all within a distance of 300 meters.